From International runways of London, Paris and Hong Kong Fashion Week to dressing up celebrities like Kareena Kapoor, Karishma Kapoor, Deepika Padukone, Vivek Oberoi, Randeep Hooda, Nawazuddin Siddique, Arjun Kapoor, Vir Das, to many more from Bollywood, she's collaborated with International artists like Maria Shatalova. 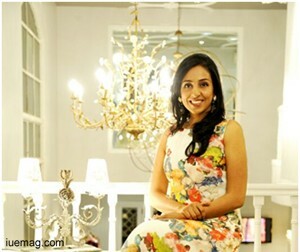 Not just a designer but a multitalented personality is Nivedita Saboo. She started about 15 years ago with a gold medal at NIFT. She went out to work at Arvind brands but her want and itch to do something bigger was her driving force. With two stores showcasing beautiful craftsmanship, she not only inspired with her entrepreneurial skills but her designs also speak volumes of her early training at NIFT and then being a constant learner. Weaving design and details together to create perfection which is enigmatic, effervescent and ingenious, couturier Nivedita Saboo believes in drawing inspiration from the entwining nuances of life itself. Finding sparkling harmony is the essence of her designs and, that bears testimony to her ever expanding, more than a decade old power packed Fashion house named Nivedita Saboo Couture. A gold medallist from the National Institute of Fashion technology, enriching and multiplying her fashion atelier with each passing year, she added a million feathered fascinator to her pretty hat by showcasing not only at Paris Fashion week but also at Hong Kong and London Bridal week. She also designed for Contestants at Miss India, celebrities at IIFA, being omnipresent with her designs at 100 years of Marathi cinema. She is a Founding Member of Pune fashion Week, an indispensible part of advisory boards at numerous prestigious fashion schools, and an award winner for social service by Sardar Vallabhai Patel Foundation. She has marked her 15 years in the industry with an extensive repertoire of achievements, accolades and innovation which speak volumes of her experience, mastery of her skills, her innate, almost intuitive ability of understanding the body type and nuances of fashion. She breathes life into a garment just by her brilliant strokes of intellect and experience! Customized trousseaus for brides and grooms, is her forte, artistically structured cuts are her gifts, draping fluidic silhouettes is her passion. Designing beyond-beautiful spell-binding pieces is her life, in a nutshell!